The same week as we celebrate the 226th anniversary of the U.S. Coast Guard’s service to our nation, it was officially announced that the U.S. Coast Guard Band will continue to call New London home after a careful review of relocation options was completed. From the moment I found out that there was a risk that we could lose this treasured part of our local culture, I did everything I could to make sure that would never happen. In October after this review was first announced, I wrote to Coast Guard Commandant Paul F. Zukunft to make the case as strongly as I could that relocating the band from Connecticut would not only be a loss for our state, but also for the Coast Guard and the families of the band members as well. Over the subsequent months, I spoke with the Admiral several times in Washington and Connecticut to share why I believed it is so important for the band to remain in Connecticut not only to uphold tradition at the Academy, but for the band families who are longtime residents of the area. After spending several months conducting a review of options for relocating the band to another part of the country, the Coast Guard announced on Tuesday that the best option is to keep the band connected to the Academy. This is great news because the Coast Guard occupies a special place in our history and culture given our maritime past and longstanding connection to the Coast Guard Academy. 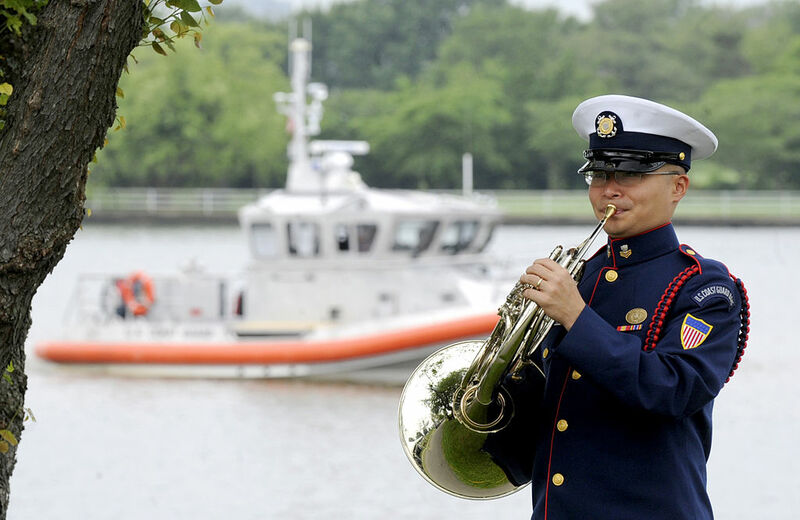 This development will resolve once and for all the home port for the U.S. Coast Guard Band, while allowing the ensemble to move forward with its goal of increasing its national visibility to better promote the Coast Guard’s service to our country. I want to thank Admiral Paul Zukunft and his staff for their thoughtful deliberations throughout this process. 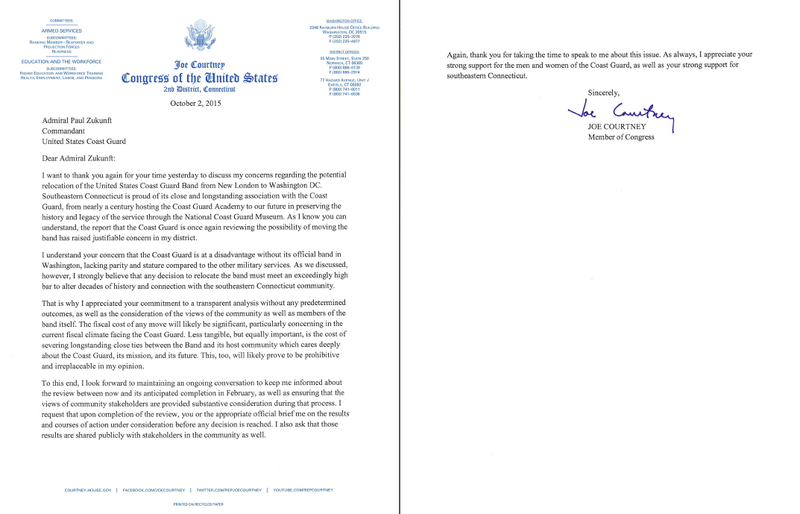 A Letter from Congressman Courtney to the Commandant of the Coast Guard, Admiral Paul F. Zukunft, making the case for keeping the Coast Guard Band in Connecticut. Click here to read the full letter. This weekend we will celebrate more than 200 years of dedicated service by the Coast Guard to protect Americans along the shores and on the water. Although the smallest of the armed services, the Coast Guard has always stayed true to their motto, Semper Paratus or “Always Ready.” Here in eastern Connecticut we will remain always proud of our special role hosting the Coast Guard Academy, the band, and soon the National Coast Guard Museum. While the band will spend more time traveling the country, I am very pleased that they will continue to call our region home.